In the countless tributes to Raúl Ruiz that followed his death last year, there were many fond recollections of the late Chilean filmmaker’s unique, even obscure erudition; his predilection for the absurd and the dreamlike; his mastery of a serpentine, exotic formal language all his own; and, above all, his astounding prolificacy, which yielded over a hundred short and feature films. In a career imbued with a kind of mysticism, this last quality seems the most magical, the most surreal, a rare accomplishment, or even the result of a perverse, cinematic form of graphomania. It’s also scarcely believable, given that the vast majority of these films are impossible to find. And yet this legendary proliferation of narratives, which seem to spawn and regenerate even after the storyteller’s death, is itself purely Ruizean. In fact, there was nothing especially numinous about Ruiz’s output, other than his remarkable tirelessness and insatiability—and his skills as a sly and canny film producer. Bérénice Reynaud aptly described Ruiz as an artist “on a course against death to exhaust the possibilities of narration,” but he was also just damn good at raising money, indefatigable in getting work, and versatile with his budgets. It may sound like a disappointingly pedestrian read on an otherwise superhuman—or perhaps supernatural—career, but it’s no small achievement to be both shrewd and a savant, nimbly flitting from film to television productions, between nations and languages, producers and funding bodies, and yet creating a large and distinctively personal body of work. Of course, this didn’t always yield spectacular results. Indeed, most of us know Ruiz’s wit and mastery mainly from Mysteries of Lisbon, or from the run of high-production-value art-house hits he had in the nineties and early 2000s (including Genealogies of a Crime, his masterful Proust adaptation Time Regained, and Comedy of Innocence), or even from those earlier, wildly idiosyncratic films that achieved international notoriety (like The Hypothesis of the Stolen Painting, On Top of the Whale, or City of Pirates, among others). But there is a whole parallel Ruiz filmography out there, one comprising a vast number of on-the-cheap TV curios and straight-to-video quickies. Mysteries of Lisbon was, after all, not the only feature Ruiz made in 2010—the other was a thriller about a blind art critic, made for the U.K. DVD market, starring Tom Conti and Daryl Hannah. Okay, so that sounds pretty intriguing. But the point is that anyone baffled and disappointed by Lines of Wellington—a bloated, hastily composed Napoleonic epic prepared by Ruiz and completed by his widow and longtime collaborator and editor Valeria Sarmiento—needs to take a more sober glance at Ruiz’s oeuvre as a whole. To be sure, there was much promise in this film, which reunites the Ruiz team with Lisbon screenwriter Carlos Saboga, and boasts a similarly extravagant canvas and star-glutted cast. But with its awkward piling-on of situations and secondary (and tertiary, and quarternary…) characters, its miasma of languages and accents, and its interminable historical pantomiming, Lines of Wellington devolves into a throwback to nineties euro-pudding, or even the everything-but-the-kitchen-sink DiLaurentiis-esque coproduction extravaganzas of the sixties. Much of the blame for it lies with Ruiz's production model. The film begins auspiciously with a graceful tracking shot, which takes in the mud and carnage of a battlefield somewhere in Portugal, as members of the Anglo-Portuguese Army struggle to fight back Napoleon’s Army, under the command of Maréchal André Masséna (played by an oddly lurking and nearly dialogue-free Melvil Poupaud, a Ruiz discovery and mainstay). The luxurious camerawork takes in an extraordinary, digitally toned canvas that encompasses not only British, Portuguese, and French alike, but also the lowly, scrambling peasants, looting the dead for whatever saleable or edible scraps they can find. This prepares the viewer for a kind of Tolstoyan Peninsular-War horse opera—War and Peace by way of Leone—and to some extent the film maintains this aesthetic over its three-hour running time. But as soon as Mathieu Amalric appears on horseback, and when we gather for an aristocratic supper with Michel Piccoli, Catherine Deneuve, and Isabelle Huppert (in an utterly pointless scene that lasts all of three minutes), what could have been a grand historical film epic suddenly becomes a mad, mad, mad, mad TV miniseries. 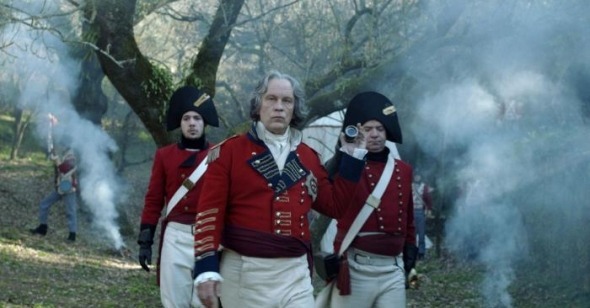 And there, at the center of the pudding, is John Malkovich as the titular Wellington, struggling through an aristocratic British accent, and looking a good two decades older than the historical field marshal was at the time of the story’s events. Not surprisingly, Malkovich’s Wellington is more ham than beef, though, to be fair, that seems to be the film’s fun little joke. Lord Wellington spends less time devising the stratagems of war and more time posing for portraits or mulling over the sketches of Belgian war-painter-in-residence Auguste Lévêque (Vincent Perez). “More color! More movement! More panache!” he scolds the long-suffering portraitist, who has a realist predilection for illustrating bloodletting, rather than heroic achievement. But once Wellington deigns to survey the scene through his field telescope, violence and human misery is precisely what he sees, and this is where Sarmiento and Saboga place the film’s emphasis. Refugees of seemingly every nationality and social rank who are desperately trudging away from Massena’s army and toward Wellington’s not-so-secret fortification—the Linhas de Torres Vedras at Buçacco—form the backbone of the narrative. This also yields the film’s most compelling vignettes and character sketches: a stalwart young Portuguese sergeant (played by Nuno Lopes), who looks for all the world like a more sedate version of Pasolini’s clown Ninetto Davoli; a nobleman making the trek with his entire library in tow; an abusive scavenger and the feral young boy in his charge; a horny young English noblewoman who evades her governess in order to make advances on the English major; a crazed, murderous abbot who roams the countryside wreaking God’s vengeance upon any French soldier who crosses his path. At their best, these narratives can be enjoyable, even intermittently comic and touching, but the film is so distended with these little situations that few command much attention. What’s more, unlike the mazelike, time-hopping complexity of Lisbon’s stories-within-stories-within-stories, Lines’ narrative is so rigorously linear, so ploddingly unidirectional, that there is very little pleasure in the telling. All this is a pity for Sarmiento, who is likely to shoulder most of the blame for the film’s dullness, but whose notoriety as an important filmmaker in her own right is well overdue for recognition. Along with her husband, and like so many of their fellow countrymen, Sarmiento fled Chile following Pinochet’s military coup in 1973, and so joins an illustrious diaspora of exiled Chilean artists that includes the novelist Isabel Allende and filmmakers Patricio Guzmán, Miguel Littin, and Marilu Mallet. Some of the renewed interest in Ruiz’s work following his death should rightly rub off on Sarmiento’s own work as a director—especially the documentaries about the experience of women in Chile she made during the Popular Unity years of the early seventies, which have been out of circulation for decades. Unfortunately, Lines of Wellington, which cleaves too closely to Ruiz’s least effective tendencies as a filmmaker, is unlikely to stoke much interest in this largely undersung filmmaker.